Sean Milnes is on his way home from Milwaukee right now, I'll have a full recap of the event in the next day or so. 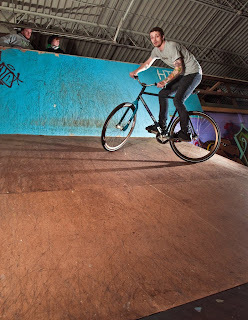 Rumors have been flying that Shawn wheelied a 5 stair handrail. Bonkers! All you BMXers should know that fixed gear riders can't manual so they're forced to wheelie. I challenge anybody to wheelie the rail at Haven!! !